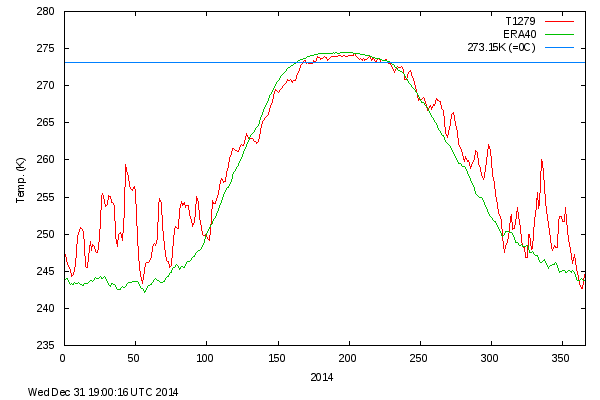 Climate experts say that the Arctic sea ice is melting down, and will be gone by 2013. The amount of sea ice in the Arctic is essentially identical to 20 years ago. But snow coverage has increased dramatically, and we know that this was caused by global warming. To be fair – the 1995 image didn’t show snow coverage. On the other hand, even though the extent – around the edges – is slightly less today than back then (as if that meant anything of note), if the color coding is accurate – the ice looks to thicker (older) now, then back in the 1995 image. Compare 2014 snow cover to 2015. I will check, but am willing to wager 2015 snow cover is as high as 1995. Well… the past 2 years were colder than 1998… which was a peak in a warming cycle of 30ish years… something changed… CO2 went up but something else changed… sun activity or whatever… rather than admit being wrong … going back to the drawing board…. they double down and attack their critics..
And you point is Michael? Cold means Global Warming Hot means Global Warming ah whatever happens it’s Global Warming. That is a bucket load of snow. REN gave us this image yesterday. It is a real eye opener. Indeed it is! I wonder what my alarmist friend will think…. She’ll probably try to discredit the U of Illinois source. Well, are you going to believe your “friend” or your own lying eyes? I don’t think my eyes lie, and I’m certainly not going to believe this person. Why would I call her an alarmist, anyway? It’s all the feedback loops kicking in. The alarmists used to acknowledge that CO2 couldn’t cause catastrophic warming, hence their imagined feedback loops that would get out of control. Now they just claim carbon pollution is destroying the world. And not even pseudo scientific explanations are required for that, since the true believers never even understood what was claimed before. Global warming was coming, it would all get quite manic. Doom and disaster for us all, of that they were sure. Hello blazing hot summers; goodbye village greens. Comparison of ice and snow cover in the Northern Hemisphere on May 5th, 2014 and 2015 and 6 May, 2013 and 2015. 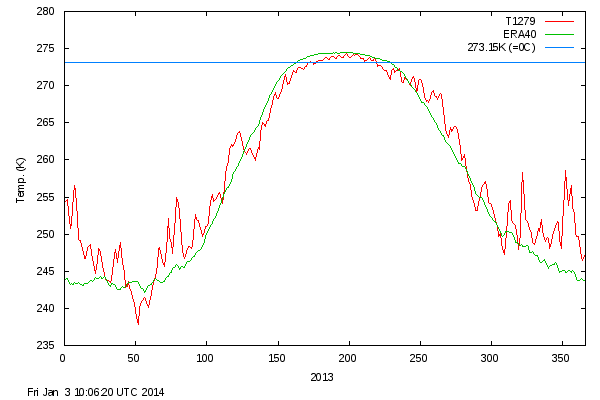 Besides the sea-ice “death spiral”, another failed forecast is the “Tropospheric Hot Spot”. Dr. Bill Gray has come out with a statement explaining the big mistake which computer climate models swallowed hook, line and sinker, which makes them be so wrong. I hope you can find some way to allow your excellent site to link to Dr. Gray’s statement, for, though it will contain too-much-information for some, I think it is one of the clearest explanations I’ve ever read of the problem. It deserves to be spread all over the web. Wind strength determines the evaporation. At low solar activity, wind force decreases. What really opened my eyes was Gray’s ability to explain what actually happens at the very tops of hurricanes and tropical thunderstorms, and how it is in some ways the opposite of what is plugged into the climate models. Is the pilot may get confused about the state of the atmosphere? “The altitude of the tropopause, and thus the thickness of the troposphere, varies considerably. Typical altitudes are 55 000 feet in the tropics with a temperature of –70 °C and 29 000 feet in polar regions with a temperature of –50 °C. Because of the very low surface temperatures in polar regions and the associated low level inversion, the temperature lapse profile is markedly different to the mid-latitude norms. In mid-latitudes the height of the troposphere varies seasonally and daily with the passage of high and low pressure systems. Monthly Atlantic Multidecadal Oscillation (AMO) index values since January 1979. The thin line indicates 3 month average values, and the thick line is the simple running 11 year average. By choosing January 1979 as starting point, the diagram is easy to compare with other types of temperature diagrams covering the satellite period since 1979. Further explanation in text above. Data source: Earth System Research Laboratory at NOAA. Last month shown: March 2015. Last diagram update: 14 April 2015. AMO began to decline. More than 30 years drop in temperature in the Atlantic. “Since the direction of the thermal gradient is reversed above the tropopause the thermal wind reverses to easterly. The horizontal thermal gradient is at maximum just below the tropopause, where the jet stream occurs. The Bridge need not go to waste ; it can be used as a “reject” like on a production line. hey, we drive on the left side of the road down here, you guys drive on the right side. “Police have called off the search for two Dutch scientists. Unusually thin ice likely played a role in their presumed death in the Canadian Arctic this week. Researchers Marc Cornelissen and Philip de Roo are presumed drowned after they appear to have broken through the ice while on a scientific expedition. The nearest weather station to the accident site is 200 km to the south at the airport in Resolute, Nunavut Territory. The temperature there on Tuesday the 28th April rose to a high of -9°C (16°F) the low was -12°C (10.4°F), light snow fell throughout the day. There were light winds out of the east. The previous day was very sunny with a high of -8°C (17.6°F) and a low of -13°C (10.4°F). The airport is in a sheltered cove on the south end of Cornwallis Island. The skiers were 200 km (124 mi.) to the north on the open ice (of Penny Strait?). Currently the ice thickness in the Strait varies from 2 meters (6 feet) to 5 meters (16 feet). The nearest “open” water is a tiny patch in the Mackenzie delta about 1100 kilometers away. Open ocean is over 2,000 km away near Nuuk, southern Greenland. There is still minor ice cover on Lake Superior 3,300 km to the south. Total global sea ice cover at the time was about 1 million square km. above the mean. All land expeditions to the Bathurst Island area are carried out in April, after the sun reappears but before spring makes ice travel hazardous. Spring arrives in early July. The ice is perfectly safe in April except for occasional leads (cracks) caused by winds, tides and currents. These three elements are amplified in narrow straits. “Shore leads” form between the drift ice and a shoreline. “Flaw leads” form between fast ice (frozen onto the seafloor or shore) and the drift ice. Leads form and heal throughout the year, temperature is not a factor. It is likely that the skiers experienced overheating while pulling sledges on Monday afternoon in bright sunshine and a “mild” temperature of -8°C. There was a fresh breeze in the hamlet of Resolute most of that day; such a breeze can shift ice, which could open a lead, and then cover it with snow. The skiers were pulling sledges from the front and may not have been tied together. To defend their needless deaths while performing a grossly negligent publicity stunt, they have been described as scientists or experienced polar explorers and “researchers”. One cannot fall into a lead on the beaches of Antarctica. A tourist trip to Antarctica hardly qualifies someone to travel over sea ice on the opposite pole. The so-called Cold Facts support team lodged in a warm hotel room in Resolute attempted to send a rescue flight but it was grounded for days by a blizzard. They opted for a ground attempt by snowmobile. Did they believe they were rushing out onto a melting ice sheet? Did the government plane refuse to land at the accident site because of “poor ice conditions”, or did the blizzard and numerous pressure ridges or the possibility of a hidden lead discourage them? Did they even have skis? Take a look at Resolute (or any other Arctic village) on Google earth. The tank farms for diesel and gasoline storage are huge, almost as big as the town sites. Petroleum makes it possible for people like the Cold Facts team to live comfortably in the arctic. Perhaps next year they can go in their underwear and go solar due to global warming. The Guardian story says that the thin ice and open water was encountered 200 km south of Bathurst Island. That puts the “drowning” site in the middle of Prince of Wales Island. More and more frequently neophytes from outside this country are coming here to sail the Northwest Passage or photograph the last polar bear or make a phony claim to have rowed to the pole. They get stuck in the ice or eaten by an extinct bear or they drag a rowboat over ice to where the magnetic pole used to be in 1996. All of this nonsense by these nimrods costs money. The territorial Government has a tax base of perhaps 15,000 people. The search and rescue costs are too much for the locals and their semi autonomous status. Rich, over privileged, misinformed kids from suburban Amsterdam or London are imposing unnecessary costs on a struggling regional economy for political grandstanding. This is the Arctic equivalent of defacing ancient artifacts on the Nazca Plateau. It’s all lies all the way down. Just last month the Guardian had displayed supreme hypocrisy in claiming that David Rose, a writer for the Mail on Sunday, “is known for his inaccurate and misleading climate change coverage.” The Guardian regularly publishes hatchet jobs on Dr. Willie Soon, implying he is not a serious scientist. “Cold Facts” is probably a front for the WWF and possibly underwritten by the Guardian as well. Now its founder is dead. These unfortunate bumpkins were neither scientists nor researchers; they were cannon fodder in a disgustingly corrupt political stunt. Instead of effusive praise and a fictional hagiography, the Guardian should pay for a recovery effort so the families can take them home. for all solar radiation that affects the thermosphere, unless otherwise noted. dissociation or ionization of the atoms or molecules (primarily O, O2 and N2). products [Rees, 1989; Hargreaves, 1992]. in order to model the heating input in the atmosphere correctly. thermal inertia, the diurnal bulge has its peak at around 14h–15h local solar time. and enhancement of this multi-satellite accelerometer data set will be provided by ESA’s Swarm mission. improved accuracy of the data and increased insight in the possible sources of error. signal for CHAMP, GRACE and Swarm. satellites, radiation pressure modelling errors dominate. It is ice free summer which is being projected, not May 5. Look at September 5, and there is a difference between 1995 and 2014. Smaller, admittedly than Wadhams projected, which is not a surprise. RIIIiiight! Look at the evidence. No matter how they spin it the Arctic is back on the ice increase part of the cycle and there is a lot more snow in the Northern Hemisphere RIGHT NOW! The last two summer seasons the Arctic air temperature has been below normal too. In fact, Gail, if you look at all the DMI data, you will find that 2013 and 2014 had the SHORTEST time above 0ºC in the whole of the data series. Yes I noticed that. However you will never get a Warmist to see it. If we did not have lying crooks for leaders we would be preparing for the cold cycle (and praying it is not the big drop.) Instead we have crooks lining their pockets and feeding the sheeple B.S. while planning to leave them to starvation and riots when the time comes. THAT is the information I would like to get through. Flaming Liberal (her term) Rosa Koire has these lying crooks figured out. I just hope she can wake up more people. 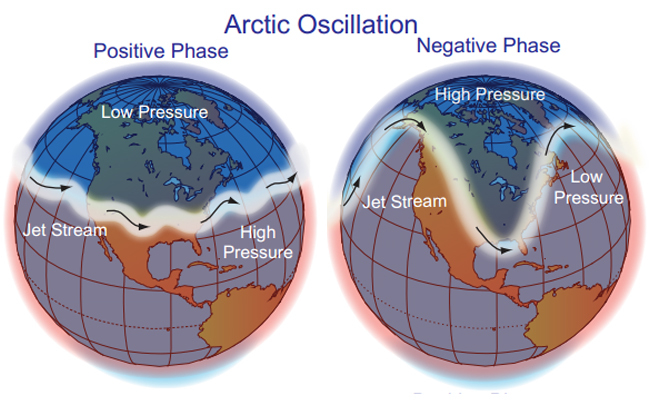 It is pretty darn obvious given the polar vortex/polar express/Canadian clipper the last few winters that the earth is now in the negative phase as it was in the 1970s. The 1990s the Arctic was in the positive phase. REN, if you can follow his posts gets into the nitty-gritty. My comments about the magnetic field of the sun does not show up in WUWT. Too bad. Steven… any idea why nobody in the Big Media nor some Big Politician is picking up on Arctic Ice Recovery or all this Data Fraud?? Are the Political Forces of Alarmism and the EnvironMeNTaL movement just that strong?? What this unfulfilled prediction that Professor Wieslaw Maslowski made in December 2007 shows just how unreliable these powerful computer models are. “In particular, Professor Maslowski is adamant that models need to incorporate more realistic representations of the way warm water is moving into the Arctic basin from the Pacific and Atlantic oceans.” It must have done no good to do this judging from how far off his predictions are. Who reported this ? the IPCC, the Meteorological Office…. No, that was the US Weather Bureau in 1922. Why do these alarmist continue to make themselves out to be fools? Right after hurricane Katrine hit N.Orleans the weather prognosticators were predicting that due to man made global warming we would have 5 major hurricanes a year hit our coasts, and 3 of these would in all probability be cat 5, duh, what happened? We haven’t had the first. In Dec. 2007 Al Gore’s noble prize winning speech he said the ice cap was falling off a cliff and would be completely gone in as little as 7 years, so I guess all his polar bears have since drowned, what a tragedy another species wiped out by man. Reblogged this on John Hargrove’s Weblog. What do you make of these two photos? Do you see any difference there? If so, why might that be?